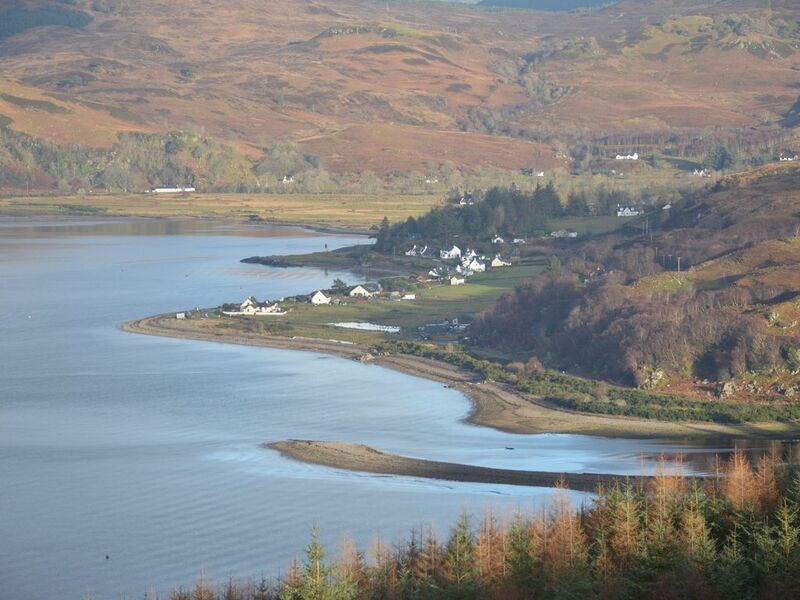 Tigh-na-Camus (which means in Gaelic, House by the Bay) is a self-catering detached cottage situated in a fantastic rural location next to the seashore in the picturesque village of Glenelg, with uninterrupted and stunning views across the bay to the Isle of Skye. It is a five minute walk to the centre of the village, where you will find the local grocery shop and post office and pub/restaurant. Only a short drive will take you to the neighbouring villages which hold a host of amenities. Tigh-na-Camus is a traditional croft house, with a large modern extension at the rear. This incorporates a bright spacious fully equipped and fitted kitchen with a traditional pine table for breakfast or informal meals. Also on the ground floor is the modern bathroom with a curved shower as well as a double bedroom with twin beds. The lounge and dining room. On the first floor are two double bedrooms and a small single bedroom, all with spectacular views over the Sound of Sleat and the Isle of Skye. There is also an upstairs toilet. With its comfortable separate dining and living rooms plus the sun room, it is an excellent house right next to the beach to appreciate the wonderful scenery right outside its door. The large bright sun room at the front of the house is a wonderful place to sit and relax at any moment of the day; the spectacular view across the bay to the nearby Isle of Skye presents a breath-taking vista of unspoiled beauty and can be appreciated in all weathers and is a great favourite with visitors who can sit and wonder at the infinite beauty of Mother Nature. Tigh-na-Camus sits in the middle of a large private enclosed garden with a picnic table and a bench to relax and enjoy those uninterrupted views southwards down to the Sound of Sleat and across to the Island of Skye. 2 of the double bedrooms have double beds and the other one has twin singles. All beds had brand new mattresses in 2017. 3 flat screen TVs: 32", 23", 21"
All radiators throughout the house are brand new, installed in January 2018, all with individual controls. Electricity is included. Induction hob and oven and microwave. Fridge freezer. Coffee makers (Filter and Cafeteria) and kettle and 4 slice toaster. There is an extensive library of books (adults and children's) to enjoy, as well as an assortment of DVDs. In addition to the above there are also some children's videos for the TV/Video combi machine for really wet days. (not listed above). Travel cot and a high chair are always available at no extra cost. Two well behaved dogs are allowed (small additional charge per dog). No dogs are allowed upstairs, on the beds or furniture and we would appreciate it, if dog owners would please remove any mess which is done in the garden so as not to spoil the pleasure of the garden for the following guests. I am originally from Glenelg and was very lucky to grow up in this special place. Due to work commitments I have spent the last 34 years living at various times in five different European countries. I love to come back to Glenelg whenever I can and am always sad to leave. Tigh-na-Camus was originally the local police house and I remember as a child being taught how to play badminton by the police officer who lived in it. Since my husband and I bought the house we have over the years sympathetically changed a lot in the house. The biggest alteration was when we added the modern extension to the rear of the property, though still managing to maintain the traditional croft house look at the front. Tigh-na-Camus has a very special feel to it, tranquil is how many describe it, which is probably due to its age (it was built in approximately 1897) and its character coupled with the modern comforts & facilities of the large bright family kitchen and bathroom. The sun room is also a treat to sit in, be it when the weather is cool or super hot, the ever changing vista in front of you will work its magic. It is a view that you will never tire of or forget and probably like me, wish that you could take it with you when you leave. Modern bathroom with separate curved shower and bath. Heated towel rail. All bed linen, towels, kitchen linens and hand towels in both toilets. Filter coffee machine and a cafeteria. Separate dining room with large table perfect for social eating. Sits 8. A Travel Cot is available at no extra cost. A high chair is available at no extra cost. Tigh-na-Camus had everything you need for a relaxing holiday. Tigh-na-Camus was very clean,warm and beautifully presented. Lovely sized kitchen which was well equipped with everything we needed. In the evenings, after a visit to the glenelg pub, which is a five minute walk away, we sat in the sun room looking over to Skye until dark, it's a beautiful view. We will be coming back to Tigh-na-Camus and will highly recommend it. Comfortable place in a beautiful location. Great house in a beautiful location, we were very comfortable, views from the sun lounge were stupendous. The waterway between the shore and the Isle of Skye was lively and interesting, the village was friendly and relaxed, the area offers a lot of interest. The local Inn provides great food, great beer, live music and a friendly and welcoming atmosphere, the village shops caters for all basic needs. The only anomaly was the lack of bath towels, it does say in the property description that 'only hand towels are provided' however this is so unusual , in my experiance, that it did not penetrate. Suggest that this is made more obvious in some way. However we managed and reccommend this property wholeheartedly. Great time had by us all during our stay - four adults and our dogs. The cottage is an ideal base for exploring the Scottish Highlands. It was lovely to wake up and go to sleep listening to the water lapping in the Loch. The kitchen was well stocked with cutlery, crockery and lots of cooking essentials. We ventured to Skye a couple of time using the Glenelg to Skye Ferry - some spectacular scenary. Lovely meals in the Glenel Inn. Would highly recommend and would visit the cottage again when visiting the Scottish Highlands. Property was spacious and well-equipped. Only disappointment was no provision of bath towels. A magnificent week; Mediterranean weather (30 degrees); great wildlife; good food in local Inn; wonderful boat trips out to Canna.